UB biomedical engineers have acquired a rapid-prototyping machine to aid their groundbreaking efforts to manufacture living tissues and organs, and fabricate customized implants and prostheses, among other projects. This rapid-prototyping machine will assist UB biomedical researchers in their groundbreaking work. 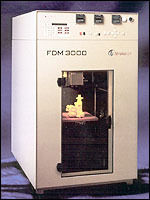 The FDM 3000, manufactured by Stratasys, also will be used to spur new collaborative projects involving UB researchers from a variety of disciplines, including medicine, engineering, computer science and even anthropology, according to Bahattin Koc, assistant professor of industrial engineering in the School of Engineering and Applied Sciences. More commonly used to produce prototype parts and product designs for companies that manufacture vehicles, airplanes, toys and many other products, rapid prototyping machines have become valuable tools for universities engaged in biomedical-related research projects, said Koc, who is coordinating UB's research efforts using the machine. Acquisition of the machine was funded in part by a $45,000 grant from UB's Interdisciplinary Research and Creative Activities Fund, administered by the UB Office of the Vice President for Research. Use of the machine will encourage collaboration among various UB researchers, opening the door to new external grant opportunities for the university, according to Jaylan S. Turkkan, vice president for research. "This machine will provide prototyping capability for a wide array of UB researchers working in fields as diverse as biomedical engineering and assistive technology to architecture and anthropology," Turkkan said. According to Koc, the prototyping machine can produce within hours complex 3D structures directly from computer imagesbuilding the structures from the bottom up in .007-inch layers using ABS (acrylonitrile/butadiene/styrene) materials, a very durable, heat- and chemical-resistant type of plastic. The machine also can be used to fabricate from medical-grade material biomedical devices developed by UB researchers, Koc said. An expert in computer-aided design and solid free-form fabrication, Koc will work with UB researchers on design and fabrication methodologies to produce from computer models complex 3D parts used in bioengineering applications. He also will investigate the machine's use for fabrication of "smart" materials, composed of multiple layers of different materials possessing different properties and functions. Researchers from the Center for Hearing and Deafness, for example, could use smart materials to build a hearing aid formed from materials selected for comfort and durability, Koc said. The tissue-engineering research of Stelios Andreadis, associate professor of chemical and biological engineering, is among current UB projects that will benefit immediately from use of the machine. Andreadis is developing a method to construct new blood vessels for use in heart-bypass surgery. In tissue engineering, cells will be seeded onto porous scaffold structures fabricated by the prototyping machines, Andreadis explained. These scaffold structures support the cells as they form complex 3D tissues. "This is really useful since current technology cannot recapitulate faithfully the structure of complicated organs and appendages, which contain multiple cell types, said Andreadis. "With some major modifications, this technology has the potential to address these issues. "Ultimately, tissue engineering may provide off-the-shelf tissues and organs for transplantation to replace or restore tissue function," he added. The prototyping machine also will be used immediately to advance the work of Stephen Bauer, clinical assistant professor of rehabilitation science and director of UB's Rehabilitation Engineering Research Center on Technology Transfer (T2RERC). Bauer is a leading researcher in the development of assistive devices and prostheses. Using the prototyping machine, Bauer can develop functional prototypes of customized prostheses and assistive devices produced from computer tomography (CT) scans or magnetic resonance imaging (MRI) of the patients. Similarly, the machine can be used for dental applications in the development of custom-made dental implants, according to Koc. In addition, Koc said, the machine can aid in surgical planning: creating physical prototypes to aid surgeons in understanding the abnormal anatomy of a patient before actual surgery. This is especially useful for facial and head surgeries. The machine also will be used in the classroom as a teaching tool for engineering students, Koc said.